11131 E Bellflower Ct Sun Lakes AZ just listed for sale! 11131 E Bellflower Ct Sun Lakes AZ is a new listing in Palo Verde Country Club. This active adult retirement community offers just over 1,000 homes. Palo Verde is part of five communities that comprise Sun Lakes. Each community offers amenities such as golf, tennis, pickle ball, restaurants, fitness centers, arts and crafts and much more. This home at 11131 E Bellflower Ct is a three bedroom, two bath situated on an oversized lot and private pool. Imagine spending your winter mornings sipping coffee overlooking the pool and lush landscaping. Take in a game of golf or tennis and then relax in your resort backyard. Winter doesn’t get much better than Sun Lakes, Arizona! Perfect for entertaining, this home provides plenty of space for traffic to flow indoors and out. Backyard BBQ’s with friends or family is a great lifestyle combined with all of the other amenities Palo Verde has to offer. 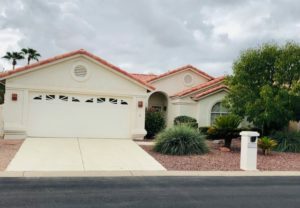 New owners of 11131 E Bellflower Ct Sun Lakes AZ will enjoy the amenities of both Cottonwood and Palo Verde Country Club. Operating as one homeowner association, you have access to all amenities. Think of all the opportunities to enjoy the outdoor active adult lifestyle and meet new friends and neighbors that enjoy similar activities. The neighborhood is warm, inviting and easy to fit in. 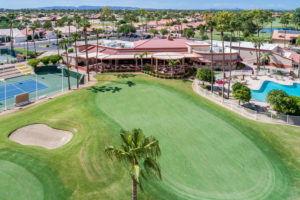 People love Palo Verde Country Club for its smaller size that allows for a more intimate close-knit community. And, the picnic area and bocce ball courts provide another opportunity to live the active adult lifestyle. Are you ready to learn more about 11131 E Bellflower Ct Sun Lakes AZ? Contact us here or call 480-440-0849 for more information.